In this much anticipated sequel in the "Matched" trilogy, "Crossed", picks up where "Matched" left off and we find Cassia still willing to do whatever it takes to find Ky even if it means risking her life. We're introduced to new characters in Vick, Eli and Indie and while we see very little of Xander (insert disgruntled sigh), we learn he has a secret he's been keeping from Cassia. Cassia, along with the others will face quite a few obstacles as they attempt to cross the Carving which I imagined to be similar to the Grand Canyon. Throughout her journey, she's discovered a strength in herself that she never imagined possible and she's excited at the prospect of what her future with Ky will hold, especially once they reach the Rising. What she doesn't expect is his resistance or they way he begins to close himself off to her. What's going on? What's happened to the Ky she fell in love with back on The Hill? When they first reunite everything seems to be as it should (with lots of kissing) but the closer they get to finding out where the Rising is, the more he pulls away from her. Cassia begins to question everything, her feelings about Ky, her sorting ability and when she discovers Xander has a secret and that both Ky and Indie have known about it and kept it from her, she questions her trust in both of them. To make things even more interesting, Ky has a secret (or two) also, including something he has in common with Cassia but he can't reveal it to her just yet because it could put them both in danger. Nothing is what it seems (including those pesky little blue pills) and everything and everyone seems to have an ulterior motive. Who can Cassia trust and whose really in charge, the Rising or the Society? Is she really just a pawn in a game? Cassia is faced with tough choices, none of which are black and white, (or should I say, green, blue or red?) The things she'll discover about herself and the two boys she loves will change her forever. Even though she's still "matched" with Xander, she's continued to "choose" Ky but will that all change once she learns Xanders secret or Ky's for that matter? When the truth comes out will she still feel she ever really had a choice to begin with? The main difference in how the story is presented in Crossed is that the chapters alternate between both Ky and Cassia's POV's and one can only hope the third book will include Xander's as well. I did find the story a little slow in the beginning with the feeling of Ky and Cassia being "so close yet so far away" as they both were trying to get back to each other. It wasn't until about page 190 where everything changes and the story begins to pick up. Overall, I thought this was a great sequel and I look forward to the final book. Cassia, Ky and Xander are still good examples of strong characters and this book has more action, suspense and romance than Matched did. I'm not saying that I didn't enjoy Crossed in lots of places, but it's not one of those books where you scream "OH MY GOD I LOVED IT!" at the end. I would have probably given it a 3.5 star rating for the plot, instead of 4, but I can't do that so I'll just stick with 4. In fact, this is the second time I am trying to read it, because the first time I got so bored and out of it I just couldn't keep reading. But, I've never left a book unfinished, so I dredged up my courage and sat down to attempt it again. Maybe if it had had more action and A LOT less poetry and obsessing over Ky/Cassia (depending on whose POV it is during that chapter), I would have had enjoyed it a lot more. As I said, there were lots of things to like about Crossed, but I preferred Matched. Ky has been sent to the Outer Provinces with other Aberrations, and Cassia has been sent to a girls' work camp. They spend a lot of their time thinking about each other and what to do when they are finally reunited. After a while, Cassia manages to sneak on board an air ship bound for the Outer Provinces, to look for Ky, and Ky escapes his work place in the Outer Provinces to go into the Society to look for Cassia. Along the way, Cassia learns more about the rebellion called the Rising, and Ky wonders how far he will go for Cassia. In Matched, I think that the poetry theme worked well with the story. I liked the "Do not go gently" kind of thing in that book and all that, but I didn't like it as much in this one. I also liked how we got to see different POVs in this book, Ky's and Cassia's, but it didn't work too well for Ally Condie. Their voices were just way too similar, I actually had to keep flipping back to the start of the chapter because I couldn't figure out who was talking. Most of the time, I liked the characters. Cassia travels with a girl called Indie. I really liked Indie at first, she seemed much more out there than Cassia and not waiting for her Prince Charming to come and rescue her, and she was bold and brave and determined. So I quite liked her at the start, but then during the course of the book she just got a bit too sneaky and dishonest for me to really like her. And Cassia kept thinking of her as a friend, because Indie stuck by her, but really? I was like "Ummm... Cassia? Someone who steals and lies to you does not sound like a friend." Ky travels with two: a young boy named Eli and Vick. I liked both of these characters. They were probably what gave the character rating a 4 and not a 3, or even a 2. They seemed to be the only two characters in this book that were realistic and not obsessing over an idea. Eli asked questions that should have been asked and Vick got angry at other people's indifference. I mean, I get why she might do that, to attempt a realistic reunion for Cassia and Ky, but I didn't like it. It seemed very forced. Cassia and Ky irritated me SO MUCH. For one thing, Ky knew about the Rising since Matched, and he knew how Cassia wanted to know about it, but he didn't tell her. I accepted this fact until he still tried to hide that fact after their reunion. He was so selfish in this book. And his explanation to why he didn't want to join the Rising just didn't ring true for me. It was a stupid explanation, and he should have gotten over it. The explanation just doesn't make sense, and it nearly breaks them up. All that time endangering their lives for each other, and they nearly just throw it away. And Cassia is no better. One, she should KNOW not to take the damn tablet if she doesn't know exactly what it does and why people never want them. Rule number one with evil people DON'T TAKE TABLETS FROM THEM AND EAT THEM!!! And she doesn't confront Ky and Indie until the very last possible moment. Unbelievable. Another complacent heroine. Great. regular flash-backs of Xander. And it seems that a love-SQUARE might be in the forming. (feel free to roll your eyes here). I think Condie can write some wonderful passages. Wonderfully beautiful passages even, once in a while. However, when these passages are in a book where every few pages a character is just sitting on a rock/staring at the stars and reciting/making up poetry,, I'm sorry, my patience flies out the window. I'm not usually side-tracked when reading a book. I usually focus on what's happening and forget about the rest of the world. This book though, did not hold my attention very well. It probably took me three times as long to read it because I kept drifting off while still skimming the page with my eyes. You know how that happens? And then a couple of pages later, I would realise, "Right, I'm supposed to be reading," and be like "what just happened?" because I missed like three pages, and would have to re-read them. I also would have preferred more world-building. After this book, there are still so many unanswered questions about the world, like, who runs the Society? How do the rebels get in and out so easily? Why is "the Enemy" bombing the Outer Provinces instead of the Centre? Is the Society over the entire world, or just America? What is the Warming, and how does it connect to the Society taking over? I recommend this book to those who felt that Matched was an absolutely, totally amazing book (I'm sorry, but I did not.) If you thought that Matched was just "okay", then chances are you will be disappointed with Crossed. I hope Reached is better. I think we should all agree that we will never take pills that we have no idea what they do. That’s a key lesson Cassia should have learned heading into “Crossed,” the second book in Ally Condie’s Matched trilogy. In the second book, Cassia is out traveling through the wilderness to find Ky, her long-lost lover who’s been forced into the Outer Provinces to fight for his life. Cassia takes with her a cache of blue pills given to her by Xander, the boy she left to follow Ky. The Society has told citizens all along that the blue pills equal survival. Just take a couple if you find yourself without food and they will keep you sustained until you reach a meal. But can the Society be trusted? They’re known to spread lies to keep the population in a constant lemming status, but this lie may be deadly. I have a hard enough time already taking aspirin from someone else, and now who knows how long it’ll be until I ever take any medication ever again. How do we know those pharmacists can be trusted?! In all seriousness, this is a good book. It has less sci-fi development in Condie’s world as opposed to the first book, but it has Ky and Cassia’s inner monologues on how much they love each other, and I love me a good star-crossed lovers story. This left me really anticipating what will happen in the third book, as it looks like there’s going to be a lot of development on how the Society and the Rising will act in a final showdown. Good lead into the third and final book. I really wanted to love Crossed, but it just didn’t happen that way. I still enjoyed it overall, but it certainly wasn’t my favorite. So, let’s do this thing list-style. 1. Cassia and Ky’s relationship. Somehow it just didn’t seem real. It was almost like more of a learning experience than real love. 2. Even though most of the story was spent as a journey, it often felt like it wasn’t really going anywhere. 3. It seemed as if Cassia had taken a step back in her growth since Matched despite all the risks she took. 4. We didn’t actually learn that much more about the Society or the world’s past. 1. Xander. Crossed completely solidified my stance as Team Xander! I really admired him for not completely giving up on Cassia and trying to win her affection in a respectable way. 2. Though it seemed Cassia had taken a step back in growth through most of the book, she took leaps and bounds just in the last chapter or so, in my opinion. 3. The duel narratives. Sometimes this bores me, but I really enjoyed hearing the story from both Cassia and Ky. The Nutshell: Though I didn’t enjoy Crossed as much as Matched, I’ll still be finishing the series when the next one comes out. The duel narratives add a new dimension to the series and I found it quite enjoyable. Also, Team Xander. Just sayn’. I totally can't wait until the 3rd book comes out! After reading 'Matched', you were probably like "What about Ky? Tell me more about this mysterious God!" Well, in 'Crossed', that's pretty much what the whole book is about. Ky, Ky, Ky. But, shall we complain? It's what most of us were wanting. If you were Team Xander, like many were, in 'Matched', you'll be sure to switch over to Team Ky by the middle of 'Crossed'. If not, you're insane..
Basically, the whole book is about Cassia running to her lovely Ky and escaping the psychos (a.k.a Society) that are after them. But, Cassia knows what she wants and is willing to risk her own life to get it. You go girl! It was interesting to see what lengths Cassia and Ky will go to so that they can be together. Even as they work their way to each other, Cassia's real match is planning a way to get her to notice him. I predict the next book will have some serious love triangle action going on and I can't wait for more. Matched and Crossed are definitely character driven books, rather than plot. Usually I tend not to like character driven book but I have found much enjoyment when reading Condie's books. I finished the first eager to read the second, I loved the world(and yes. I realize it is similar to that of The Giver, but it did not keep me from enjoying the author's interpretation of such a world or the characters and story she paired it with. The best part about Crossed was the character development. At the end of Matched, the readers were left thinking they knew the characters, but when Crossed began I realized that I had only scratched the surface of the characters, their personalities, backgrounds and beliefs. Throughout Crossed Ally Condie revealed more and more of the intricacies of the characters we followed. I also enjoyed meeting the new characters and immediately grew to love them as much as the older ones. Eli was adorable and fun, Vick was heart breaking, and Indie was mysterious and calculating(she reminded me of how Foxface from The Hunger Games would have been in that situation). I didn't enjoy Crossed as much as I thought I would. I missed reading from the perspective of someone within the Society, and I missed reading about some of the characters that were in Matched, such as Bram and Xander. My favourite character in Crossed was Eli, because of his innocence and naivety. Cassia wasn't one of my favourite characters because of her reliance and faith in the Society, despite the harm that the Society inflicted upon her and her family. I love the cover of Crossed, I really like the colours that have been used and how the image of the girl escaping from the glass sphere, represents Cassia's escape from the Society. 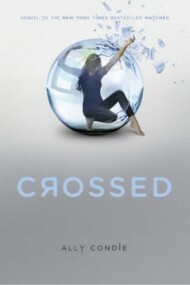 Crossed is the sequel to the amazing book Matched by Ally Condie. It is the second book in the trilogy. Crossed continues to follow the life of Cassia Reyes and her quest to find the boy she loves and the redemption from her Society life, The Rising. At the end of Matched, the reader is left wondering what Cassia will do - how will she solve her love choice between Xander and Ky? We know Ky is the man of the hour, but her childhood love for Xander is never far from her thoughts. Crossed answers that question for us and much more. And within this simple decision of love, Cassia is also to answer questions that are bigger than she is...what is the journey of life all about? Is their ever true freedom - freedom from The Society, or freedom in The Rising? Cassia believes with all her heart that The Rising is the answer she needs. The answer to her love for Ky or Xander, the answer to who she can trust, the answer to save her soul. It's the quest of a lifetime. Her journey is long and hard. She meets some she can trust and finds that others she thought she knew were keeping secrets from her, secrets that change almost everything. She is challenged. Ky is challenged. And the true conflict of the story is how they meet, and sometimes fail to meet, the test in front of them. They are both seeing the world as a different place, but for Cassia it is all new. Ky brings his family demons with him and his status as an aberration, but Cassia has never known anything outside the comfort of The Society, until now. She proves to be a strong heroine, not afraid to take chances. She endures, as well as anyone else, scourging across unknown territory. She will let nothing stand in her way of getting to Ky, The Rising, or back to her family; even back to Xander. Crossed as a sequel does not disappoint. It hints enough at Matched to keep the reader engaged and wondering about the characters met before now, but moves forward in a way that introduces new characters, settings, and plot lines to the reader in an unobtrusive way. This book is written from both Ky and Cassia's viewpoint, it shifts every chapter. I must admit, I found myself enjoying the chapters from Ky's viewpoint more than Cassia's. I'm not sure why, I can't quite put my finger on it. Possibly because I believed so much in the suffering of Ky's character and knew the true heartbreak that would ensue for him if he was to lose Cassia in this book. I kept reading to make sure Ky was safe and loved. My heart bleeds for him. I'm not sure how I feel about Xander, and sometimes how I feel about Cassia. I can't wait for the final book to hit the shelves so I can devour it as quickly as I've devoured the first two. Ally Condie - you certainly have my attention! Ally Condie does something very different in Crossed than she did in Matched. The first book of the series shows Cassia's gradual transformation from delighted citizen to disillusioned rebel. In the second book, we begin to see things through Ky's eyes. Quite literally, as half the book is told from his perspective. Through him, we see her grow from the ignorance and insecurities of the first story into a fearless, steady woman who will endure hunger and thirst, abandonment, exhaustion, and miles of desert to find the one she loves. It would almost be a fairy tale if it weren't so earthy and human. And of course, it doesn't end here. Cassia has left her family to work on the outskirts of the Society in hopes that she might get close enough to Ky to find him again. With no idea where he's gone, or if he's even still alive, she follows her instincts and some twists of fate - that would look to anyone else like the worst misfortune - until she find someone who has actually seen him. Who can point to where he's gone, and even run with her part of the way. Joined by some unlikely companions (because what journey story would be complete without them), both Ky and Cassia make their own ways across an unforgiving landscape to find each other. Along the way, we learn a lot. Most importantly, we learn just what sort of experiences have fashioned Ky, mystery-boy extraordinaire. We learn something of what makes him tick. Far from making him less interesting in the revelation, it helps to pull him out of the general "emo boy" that many other reviewers pegged him as, and give him real depth and breadth. It's absolutely worth all the desert miles to learn about him. But we also learn about the Society's real opposition, the rebellion that's stirring and growing, not just outside its borders, but within the very capitol. And we can't help but learn a good deal more about a character Ky would prefer to forget - Xander, the other tip of the triangle. There's love and death and dirt aplenty in this book, and it's all good. Not as good as the first one,but still enjoyable. There were some touch and go moments but overall I was very happy with this book.It showed what you would do for the people you love and the people you just met.It showed how determined someone can be when they believe there is something good waiting for them.I was so excited while reading this and even during some of the slow moments Ally Condie had me wrapped around her finger.